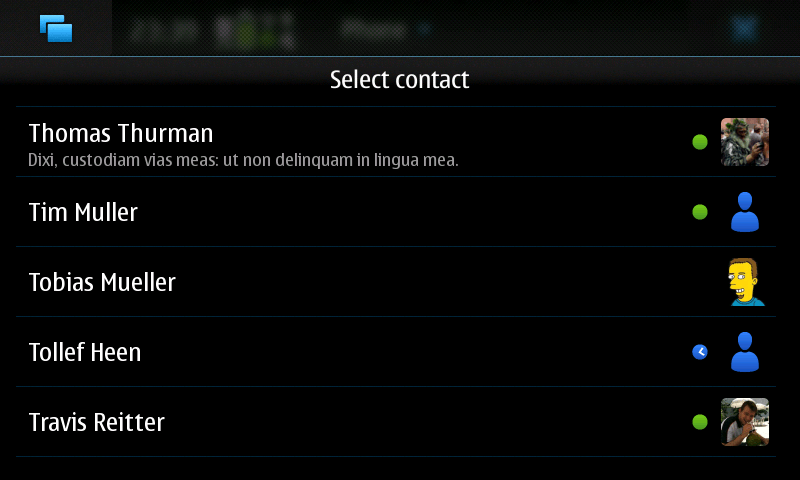 Sometimes the creation of the contact chooser used on the N900 can be slow so, using callgrind and kcachegrind, I tried to understand what is the source of the slowness. This lead me to find some unexpected, and apparently undocumented, differences between upstream GTK and the Maemo version. The widget contains a GtkTreeView that uses a model with just one column for the contact objects. How can its creation be so slow? To my surprise most of the time was spent decompressing the avatar images! The avatars of the contacts are loaded, scaled and cropped in the cell data function of the GtkTreeViewColumn as, for various reasons, we cannot cache on disk the resulting image or generate it before the creation of the widget. Following calls of the cell data function for the same row won’t need to generate the avatar anymore. Doing non-trivial operations in the cell data function is not the nicest thing to do, but this should not be a problem as the cell data function is called only for the visible rows, right? No, at least not on Maemo! To verify it just try this example program: on Maemo the cell_func() function is called once per item in the model plus once per visible item, elsewhere only once per visible item. After a bit of investigation together with Claudio, we discovered that on Maemo there is a function called gtk_&#8203tree_&#8203view_&#8203column_&#8203get_&#8203cell_&#8203data_&#8203hint() that returns GTK_&#8203TREE_&#8203CELL_&#8203DATA_&#8203HINT_&#8203KEY_&#8203FOCUS, GTK_&#8203TREE_&#8203CELL_&#8203DATA_&#8203HINT_&#8203SENSITIVITY or GTK_&#8203TREE_&#8203CELL_&#8203DATA_&#8203HINT_&#8203ALL. The hint tells you why the function was called; in the example code the function is called on the hidden rows only to get their sensitivity so there is no need to set the “pixbuf” property of the cell at this point. To fix the scrolling I had to implement some asynchronous loading of the avatars. The contact chooser now tries to load as many avatars as possible in idle moments and also tries to load first the avatars for the contacts that the user is more likely to see. The results seem quite good; now the contact list is fast, scrolling is smooth and the delayed loading of avatars should not be visible in normal cases. Stuart: Pierre-Luc Beaudoin and Alp Toker implemented video support in WebKit GTK using GStreamer months ago, but probably (I never tried it) it needs some more love before being fully working. When you use a VCS that makes it easy to manage several braches, it’s easy to get conflicts in the .list file used to generate the C marshallers. I recently fixed this problem in WebKit stealing some code used at least by various Telepathy components and by avahi-gobject, and I want to share the solution so every project can benefit from it. Then remember to remove the myproject-marshal.list file from your VCS (svn/git/hg/bzr rm). The code will search for all the functions looking like myproject_marshal_RETTYPE__ARG1TYPE_ARG2TYPE and generate the myproject-marshal.list from them, regenerating automatically the list when you change a signal signature. Update: fixed the blackslashes in the code that were misteriously eaten by WordPress. What the release team just announced sounds like a good plan for Gnome 3.0 and also a good strategy for other future major releases. Kudos to them and to the GTK+ developers! I’m sure that they will give us more details soon both on the planet and on the relevant mailing lists.